What do businessmen Steve Jobs, Bill Gates, and Mark Zuckerberg have in common? They are entrepreneurs. Entrepreneurship is a rather smart label that essentially means the designing, launching, and running of new businesses. 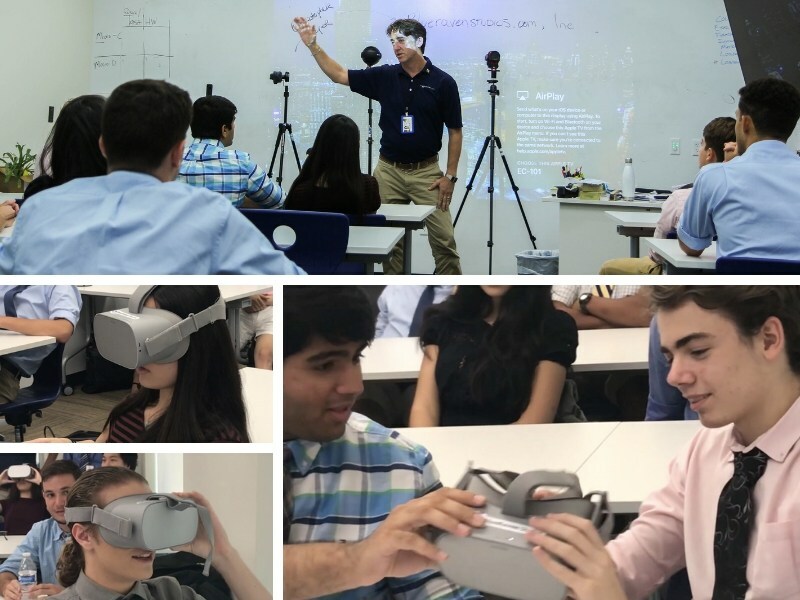 At Saint Andrew’s School, we are not only in the business of forming the Steve Jobs’ of the future but also trailblazers in the area of virtual reality. Just ask any student and they’ll say the “it” place to be on campus is the Dr. Albert Cohen Family Center for Entrepreneurial Studies. Devotion to entrepreneurship runs so deep that SA is using a new platform for promotion that most schools in the world haven’t even thought of trying yet. The virtual reality experience involving an “Oculus”. To look at an Oculus headset is like looking into the future. Picture this – a student places a light grey headset over their head like a cap and then pulls it down over their eyes. Then pressing the remote control button, a program is accessed, one that allows students to actually feel like they are someplace completely different. Saint Andrew’s School has three Oculus devices that transport people to our school virtually just with the press of that button. These futuristic goggles aren’t only in offices or in the Entrepreneurship classroom on campus, their designed purpose is to travel the world to be used to further alumni, admission, and marketing efforts during the 2019-20 school year. Mr. Daly is an Upper School guru when it comes to Entrepreneurial Studies. 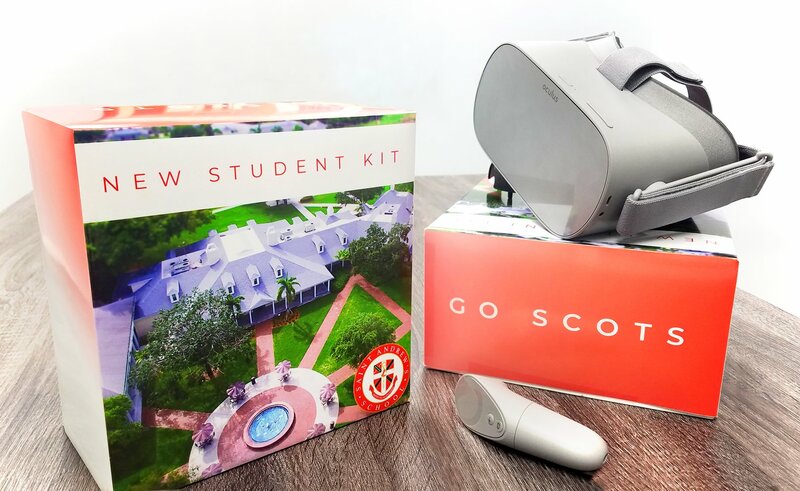 When he learned that SA is on the forefront of using virtual reality for communications and marketing promoting the Saint Andrew’s new Cohen Center, he wanted students to get learn from this leadership. Enter BLUERAVEN Studios from Ft. Lauderdale, a pioneer development company in the field of virtual reality. Mr. Daly often invites entrepreneurs like the CEO of BLUERAVENstudios.com into his classroom as guest speakers. His angle is to show students that all of these successful men and women began just like Scots students did – dreaming away and working hard in the classroom. “I invite businessmen and women to tell their stories of how they made it as entrepreneurs,” commented Daly. On Monday, November 12, Mr. Daly invited Christopher Hooper, CEO of BLUERAVENstudios.com to speak to his Entrepreneurial studies class. BLUERAVENstudios.com, Inc. has been helping customers realize their digital goals for over 20 years. Christopher and his team of Google Certified professional photographers work with fortune 500 companies like Google, spearheading the VR industry. Saint Andrew’s School is a trailblazing customer for Christopher Hooper’s company BLUERAVENstudios.com. When the Dr. Albert Cohen Family Center for Entrepreneurial Studies was constructed, SA’s very own entrepreneur in the area of Marketing and Communications, Dr. Carlos Barroso, reached out to BLUERAVENstudios.com knowing that their new technologies perfectly matched the spirit of the new Cohen Center and its programs. “What Chris and his staff created for Saint Andrew’s is truly spectacular. People on the other side of the globe can put on a VR headset and it’s like they are at Saint Andrew’s and walking into and around the Cohen Center,” said Dr. Barroso. What better way to capture the spirit of a new hub of Entrepreneurship than with cutting-edge VR technology? SA not only practices the art of Entrepreneurial studies in classrooms, but it also makes it a central part of achieving its institutional goals. While independent school and university counterparts are still using traditional media exclusively to communicate and connect with the world – media like websites, videos, photos, and news – Saint Andrew’s is doing so much more. The virtual reality “Oculus” is the school’s unique playing field. And SA is hitting it out of the park in the area of VR.